I blogged recently about some lovely Mother's Day crafts made using items from Baker Ross, and with this post I'm going to share some Easter crafts. We started with these Easter Egg House Kits. I must admit that they were pretty fiddly to put together and needed reinforcing with glue and tape. If you are making these with young children I'd strongly recommend assembling the house first at your leisure and then passing on to the child to decorate! The children loved sticking the stickers on to personalise their houses, and the finished creations are really bright and cheerful. I can see them coming out again at Easter for years to come! The we made some Chick and Bunny Pop-up Puppet Kits. All the pieces are included, and the chick or rabbit puppet is made by pushing a stick up through a decorated paper cup. This was a great craft to make when we had friends over for a play date. Because all the pieces are self-adhesive it's not messy, and it made a satisfying finished product that the children had a lot of fun playing with afterwards. Finally we decorated some 3D Wooden Bunnies. They are a simple plain bunny shape, with slot in pieces so that they can stand up. First we painted the wooden shapes with poster paints, then when they were dry I put out a selection of different bits and pieces for decorating - ric rac, ribbon, googly eyes, egg shaped sequins, pom poms and so on. Harry wanted to use some white acrylic paint to add some extra features, unfortunately Mia got a bit carried away with her white paint and hers ended up as albino bunnies! The finished bunnies stand up really nicely, and they look lovely on the mantelpiece as Easter decorations. I think that these craft kits are such good value. 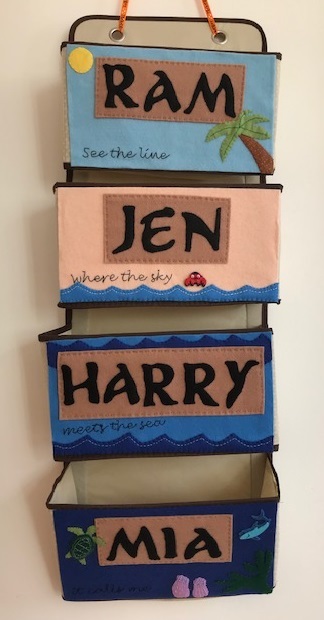 They'd be great if you were entertaining a group of children, perhaps for a party, especially as many of the kits are available to purchase in larger quantities and they often come with everything that you need to do the craft. The smaller packs are also fantastic to keep on hand for play dates if you need to quieten things down a little, and it's something nice for the guests to take home. Many people like to avoid giving too much chocolate or sweets for Easter, and craft kits like this would make fantastic alternative gifts. Those little puppets in cups look like lots of fun to assemble.